800 Koreans signed up for Vietnamese oral tests last year, an increase of 15 percent from 2016, according to reports. Near the busy Gangnam Subway Station in Seoul, about eight private language institutions have already opened Vietnamese classes. "We increased the number of classes from one to 11 only a month after we opened the Vietnamese course. We've also increased teachers from two to five," said a representative from a language school, as cited by Chosun Ilbo. More and more Koreans are studying Vietnamese to acquire language proficiency certificates, with 800 signing up for Vietnamese oral tests last year, an increase of 15 percent from 2016. 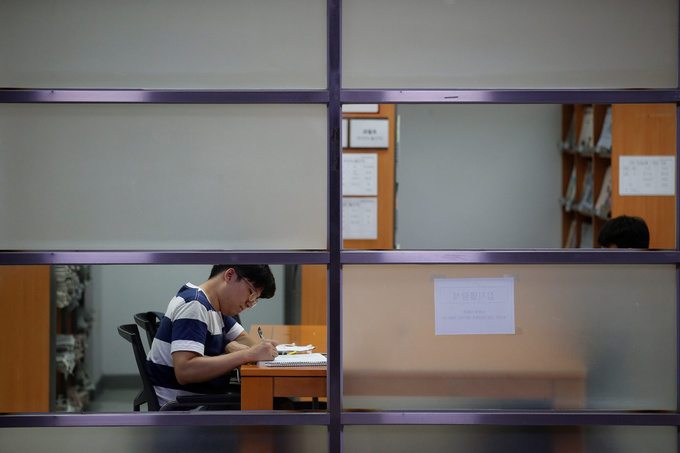 80 percent of the exam takers of the Vietnamese language in Korea are office workers from 30 to 40. The trend has shown itself ever since China has unofficially boycotted Korean products and services due to Seoul setting up the U.S.-made Terminal High Attitude Area Defense (THAAD) on its soil last year, sparking opposition from Beijing, who said THAAD’s powerful radar can penetrate deep into China’s territory. For much of 2017, South Korea’s tourism, cosmetics and entertainment industries have taken the brunt of a Chinese political backlash against Seoul. Facing difficulties from China, Koreans start to look at Vietnam as the land of newfound opportunities, especially considering the Southeast Asian nation’s rapid economic growth. "We expect a growing number of South Korean businesses will expand investment in Vietnam, the land of opportunity," Yonhap News Agency quoted an industry source as saying. The source also said Vietnam's economy has been expanding by more than six percent every year. On March 23, Vietnam and South Korea agreed to seek to boost their bilateral trade to $100 billion by 2020, or 50 percent more than last year’s total, during President Moon Jae-in's official visit to Hanoi. South Korea is also Vietnam's biggest foreign investor, with its firms investing more than $50 billion in Vietnam between 1988 and 2016. The so-called Korean Wave in Vietnam has also helped boosted the popularity of Vietnamese among Koreans, especially after Park Hang Seo, a Korean national, has made headlines in the Southeast Asian nation after coaching the country’s national U23 football team through the Asian Football Confederation Championship back in January, as cited by the Korean newspaper. "Most students are learning Vietnamese to do business there," a language-school staffer said, adding how the majority of students are in their 30s and 40s, as cited by Chosun Ilbo. Another 41-year-old office worker said: "I'm taking advantage of my lunch break to learn Vietnamese, which is more popular than Chinese these days."